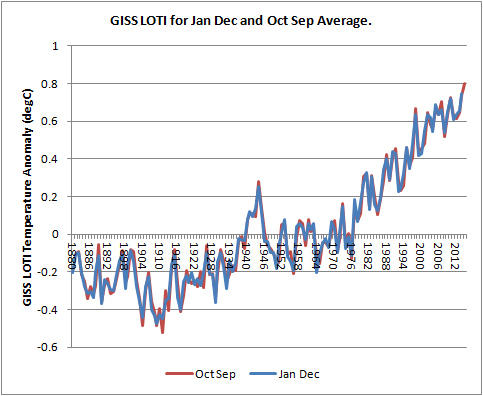 I am using the NASA GISS Land Ocean Temperature Index, LOTI, which I have used consistently for the last decade. The dataset has coverage at high latitude, unlike CRU, and is repeatable having publicly available code and data. Data is available to September 2015. So first a comparison of the two yearly periods January to December, and October to September is undertaken. First here is a plot of the two timeseries. January to December and October to September are very similar for the period 1881 to 2014. The difference between the two timeseries is calculated and used to produce a histogram of the probability distribution of the difference between the two series from 1881 to 2014. This histogram is plotted as an offset from the October to September 2015 temperature anomaly (0.799degC) and is normalised to the total number of years to produce a probability distribution summing to 1. Note that the October to September average runs from the previous year to the year in which September falls, i.e. Oct to Sept 2015 is for Oct 2014 to Sept 2015. So the resulting graph shown above gives a probability distribution of 'predictions' using the past difference between October September average temperature anomaly and the average anomaly for January to December. 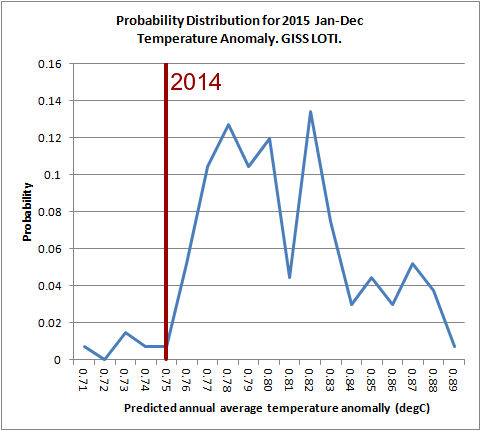 The previous warmest year in the GISS series is shown in red (2014), 96% of the probability lies above this level. The ten warmest years (Jan to Dec) are shown in the table below. If the past relationship between the October to September and January to December annual averages remains reliable this year (why would it not? ), then there is a 96% probability that this year will beat the 2014 record, and a new record by a sizeable margin is likely. PS, in catching up on some reading, the latest Hansen paper has crashed and burned, as reported by Stoat. If I recall correctly I never got round to properly reading it, I won't be bothering now.